This entry was posted on January 12, 2015 at 22:32 and is filed under Uncategorized. You can follow any responses to this entry through the RSS 2.0 feed. You can leave a response, or trackback from your own site. My first thoughts were creative, home made and fun. 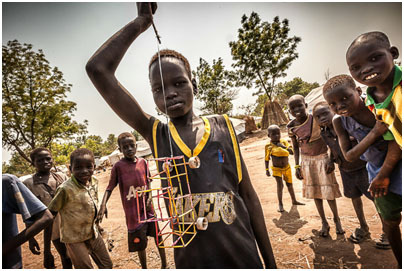 As far as the absence of girls..not sure if they have other serious business to attend to…Great captures of the children and their inventions! My immediate thought was that these children are very imaginitive and creative. As to the girls, maybe they are fetching water. My first glance noticed smiles even though the kids are in a refugee camp; then I noticed the object the kid in the middle held, then the thinness of the kids. The girls? I have a feeling they are helping care for babies and with cooking??? You are right about that, as you can see in our next post. Clever, fun, joy. That’s what came to mind. I’d like to think it’s bath time for the girls, so the boys are playing elsewhere, but the girls are probably doing chores. My comments- The children were all thin. There was little grass (more dirt). And they were all boys. I hope the young girls are playing elsewhere and fear that they are working. Very creative of these young boys but also nostalgic…I’ve seen old photos of American children playing with similar “toys”. Wondering if the girls are working? Also wondering if it’s a safe environment for girls to be out and about. They girls are working – and yes mostly it’s safe for the girls, at least in daytime. I confess that I couldn’t see past the thin children. I felt an overwhelming sadness at first. Look at the children playing and using their handmade toys, in the West we don’t see that much anymore, imagination for the most part is gone and outdoor play time is at times forced on the kids. 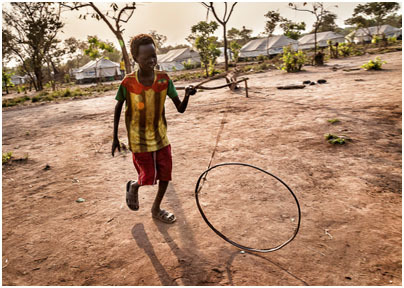 Thank God these children are able to play, laugh, and share their joy. Thank you for sharing such a beautiful story through your photos and words. The first thing I notice is their arms and legs are so terribly thin and behind the attempt at amusement with whatever they can find, a smile here and there, I only see a kind of lethargy and deep sadness. It’s almost as though they’re filing in time waiting (for something to happen). Cinuarben on the sledge is the only one I see as genuinely happy (and is he the smiling child on the far right of the first image?). Not the kind of joy you normally see in the faces of kids who are playing. Cinuarben is the exception. His smile really shines! Are there schools or some kind of education program…or do the children play all day? Wait? Wait for what? Girls….doing chores most likely. Helping. Working. Not playing with toys…. Unlike Vicki, my first reaction was that almost all of the children are smiling and so open to you, a foreign photographer. My second reaction was how incredibly sad it is that they should be happy with such a lousy lot in life. Thanks for sharing these – can’t wait to hear what happened to the girls!! Lack definitely stimulates creativity and these kids certainly have much incentive to be creative. May they know better times in the days to come. They have been through so much already in their young lives. 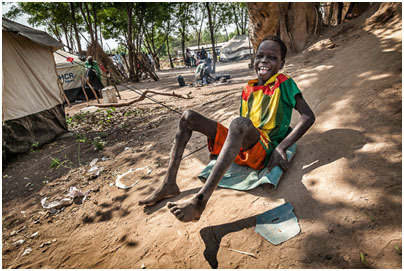 Unfortunately it’s not very likely anyone in the camps will know better times in a long, long time since there seems to be no solution to the civil war in South Sudan. That is so very sad to hear, Otto. Thank you for blogging about these camps and allowing the rest of us a view of the world we would never have otherwise. They all seem to interested in you and your camera, and so proud to show off their handiwork. It must be so difficult for them, but they still find time to play. I noticed the little boy with the Lakers shirt–since I’m from Los Angeles, that was kind of an obvious thing to note. The smiles of children always disarm me. And the lack of girls–I assume they are working alongside their mothers to make meals and general housekeeping and probably a fair amount of manual labor. I don’t expect the girls to have time to play. I hope I’m wrong. I’ll look forward to your explanation. Unfortunately you are very right as you may see in our next post. My first thought was creativity, because of that nice looking toy, then I saw all those smiles and colours. I noticed first the terrible thinness of those children. It is a wonder they have the energy to play at all. Yet they smile, and make toys, and find moments of fun. The resilience and creativity of children is amazing. When I was little, my life was certainly easier than these children’s, but we made our own fun, too, and spent endless hours playing in the dirt with sticks and pebbles. I feel sorry for children today who never have that experience. I didn’t notice the absence of girls, and look forward to hearing more about that. My first three thoughts were, fun-play-imagination. In many ways children of our world are missing out in the art of play. They are glued to their electronics and never use their imagination. These kids expressions seem to be filled with much more joy than any kid I ever watched play a video game. My first thoughts were boys, toy and smiles but then I thought I saw a child in the group wearing a skirt. So much for my gender stereo-typing. The photo of little Nhial is such a gorgeous heartbreaker. Simplicity, friendship, happiness — these are the words that came to mind for me. It’s good to see that they can still have fun, despite the circumstances. My guess as to why there are no girls around is that I imagine they’re given a traditional role as mother’s helper, for better or worse. That 3rd shot is worth it all ~ boy, such pure joy and happiness. Brilliant, even amid conditions so sad that boy is brilliant…just a chance is all he needs (a tiny slice of opportunity) and making plights like this more visible may just be what it takes. Well done!